Sankarapandiyan from Madurai, B.E. - B.Tech Graduate. Sankarapandiyan is Engineer and currently have no work experience. LINUX (RHEL AND DEBI.. C++ QTCREATOR QT FRAMEWORK INSTALATION TROUBLES.. UBUNTU 16.04 LTS UBUNTU AND LINUX SERVER SYSTEM ADMINISTRATIO.. REDHAT CERTIFIED SYS..
are one of expert skill area's of Sankarapandiyan . 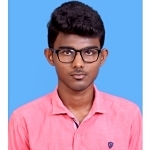 Sankarapandiyan is working in IT Software industry.